Please come to an evening of songs, poetry and memoires around the life of Poldowski , the pseudonym of Irene Régine Wieniawski. Also known as Lady Dean Paul, Poldowski was a Belgian-born pianist and composer, also daughter of the famous violinist Henrik Wieniawski. Married to an English lord, she led an extraordinary life filled with tragedy, eccentricity and art, with the prime of her career in London in the 1920’s. Among her surviving works are three dozen songs set to poems by Verlaine, Le Braz, Dominique, Samain and Blake. This evening concert will feature some of her best songs in French and English, as well as readings of her letters and essays on life and music. Born in New York City, Ms. Mok has appeared in many of the world's leading concert halls including The Barbican, Carnegie Hall, The Kennedy Center, Avery Fisher Hall, Alice Tully Hall, Davies Symphony Hall, and The Hong Kong Performing Arts Center. She is also frequently invited to play and record with major international orchestras most notably the London Symphony, the Philharmonia, the Hong Kong Philharmonic Orchestra, the Beijing Philharmonic Orchestra and the Residency Orchestra of the Hague. In his 90th year, world re-known Ravel expert, pianist Vlado Perlemuter chose Mok to be the last student to whom he would pass on his knowledge of Ravel. In 1927, Perlemuter sat at the keyboard of Ravel’s Erard grand piano and worked his way through Ravel's entire oeuvre along with the composer. In 1994, the French Ministry of Culture awarded Ms. Mok a grant to study with Perlemuter for one year. Since 1995, Mok has been performing Ravel's works in recital and was invited to teach these works at the London Royal College of Music, Welsh College of Music and Drama, The Dartington International Summer School in Devon, England, Shanghai Conservatory of Music and The San Francisco Conservatory of Music among others. In 1996, Ms Mok made her official London debut in two concerts of Ravel in Somerset House, on a restored 1868 Erard grand piano in the Great Room of the Courtauld Galleries. Citibank UK sponsored Mok’s production, ‘Ravel and the Post Impressionists’. She was also featured in broadcasts of Ravel on BBC ‘Radio 3’, ‘Music Matters’, ‘Woman's Hour’ and the World Service. Two additional productions were sponsored by Citibank UK, in 1997 and 1998: ‘Mendelssohn in London, Letters Home’ was presented in the Raphael Gallery of the Victoria and Albert Museum, and ‘A Gershwin Showcase’ --a re-creation of a 1930's radio showcase featuring a 27 piece jazz band and soloists-- was held in the sumptuous deco-period ballroom of London’s Mayfair Hotel. From 1997-1998, Ms. Mok was the director of INFORMANCE! a music program that benefited 400 children in East London's public schools. Gwendolyn Mok publications include 'Reflections on Ravel' in The Pianist's Craft published by Scarecrow Press as well as an article in Clavier Magazine that will be published in 2014-2015. She was also a featured speaker in the 2013 MTAC Convention in Santa Clara. Ms Mok is a recording artist for Nonesuch/Elektra, Musical Heritage Society, Musician Showcase Recordings, Cala Records, and EMI. Her highly acclaimed debut CD with The Philharmonia of Ravel's ‘Piano Concerto in G Major’ (released on the Cala label) was nominated for an Alternative Edison award in the concerto category. A second CD on Cala of Saint Saen's ‘Africa-Rhapsody for Piano and Orchestra’ with the London Philharmonic has been equally applauded. Her two solo CDs of Ravel’s piano works, ‘Ravel Revealed’ and Brahms Late Piano works were recorded on historic pianos for the Musicians Showcase Recording label. Both CDs have received outstanding reviews and are broadcast frequently locally and around the world. As a chamber musician, Ms. Mok appears regularly on the San Francisco Symphony Chamber Music Series, as well as San Jose Chamber Society and Sacramento Chamber Society series. She collaborates often with members of New York Philharmonic and Philadelphia Orchestra. A popular soloist with the Symphony Silicon Valley, Gwendolyn Mok appeared in four sold-out performances of The Gershwin Radio Hour, a show she co-produced in which she played Rhapsody in Blue and Concerto in F. In 2008 Ms. Mok was presented the ‘Outstanding Artistic Achievement Award’ by the College of Humanities and the Arts at San Jose State University. Currently the Coordinator of Keyboard Studies at San Jose State University School of Music and Dance, Gwendolyn began her studies at the Juilliard School of Music. She attended Yale University, where she completed her undergraduate studies, and State University of New York at Stony Brook, where she earned her Masters and Doctorate. Soprano Angelique Zuluaga has performed opera, oratorio, and chamber music throughout the U.S. and South America and can be found frequently collaborating with composers in new works. Her voice has been described as “free-floating and unfettered” (Bloomington Herald Times), “dark and delicate” (Indy Star), and “exquisite and expressive voice, capable of a wide dynamic range from the most delicate sotto voce pianissimos to full-voiced fortissimo coloratura passages” (Monterey Herald Times). In 2012 she was hailed by Fanfare magazine as a performer of “gusto and finesse”. Recent and upcoming engagements include concerts with the 2014 Carmel Bach Festival, the role of The Mother in Menotti’s Amahl & The Night Visitors with the Monterey Symphony Orchestra, Handel’s Messiah with Kansas-based Spire ensemble, and guest soloist with the Canadian ensemble Proemio as part of the 2013 Early Music Festival of Villa de Leyva (Colombia). Past performance highlights; soloist in Brahms' Requiem with the Indianapolis Symphonic Choir, Handel's Ode to St. Cecilia with the orchestra of St. Luke’s at Zankel Hall under the direction of Ton Koopman, and soprano soloist with the Youth Orchestra of the America’s St. Matthew Passion Brazilian tour under the direction of Kent Nagano. An avid performer of contemporary music she created the role of Chirinos in the world premiere of “Las Cuerdas del titiritero” by Gerardo Dirié, and collaborated with Aguavá New Music Studio in the world premiere of Aurelio De La Vega’s Variacion del Recuerdo at the Coolidge auditorium of Library of Congress. 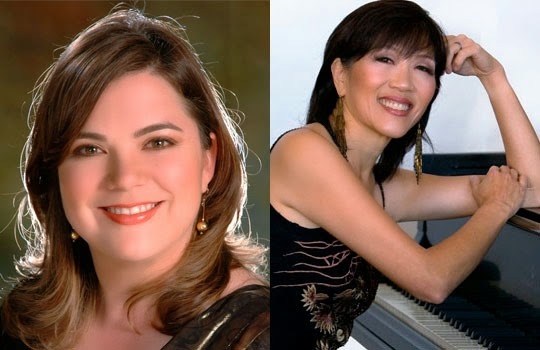 Recent premieres include a guest recital of contemporary art songs at Mannes College as part of the 2012 festival Composers Now featuring over half a dozen world and U.S. premieres. Opera roles include Fiordiligi (Così Fan Tutte-Mozart), Norina (Don Pasquale-Donizetti), La Musica (Orfeo-Monteverdi), Edilia (Almira-Handel), Euridice (Orfeo ed Euridice-Glück), Amore (Ballo delle Ingrate-Monteverdi), L’amour (Pygmalion-Rameau), Tamiri (Il Re Pastore-Mozart), and Belinda (Dido & Aeneas-Purcell). Winner of Indiana University's 2006 Latin American Fellowship, she also holds awards, grants and scholarships for her performance, research and concert programming from the Early Music Institute of Indiana University, The Latin American Music Center of Indiana University, Metropolitan Opera Council, Universidad Del Valle National Art Prizes, and the Embassy of Spain. Ms. Zuluaga began her singing career in Cali, Colombia, South America where she received her Licenciatura en Música with Emperatriz Figueroa as her major professor in voice at the Universidad del Valle. Further studies in music lead her to the Jacobs School of Music and Early Music Institute at Indiana University where she completed two master degrees in voice performance and early music.